BDO Insights: Why an effective strategy is necessary to grow further! You have successfully navigated the first phase of starting your own business, but have now reached a stage where you want to go to the next level and perform better. You need a qualified adviser and coach, who can help you with the growth of your business. Someone who asks positive yet critical questions and assists you with ideas. 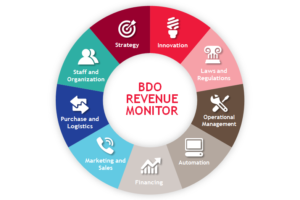 We do so by using the BDO Revenue Monitor. The monitor helps you analyse your improvement potential in terms of both quantity and quality. On the basis of nine performance fields it is set out clearly where you can realize profits. The monitor is unique because it makes an estimate of your improvement potential in hard Euros. And you can work with that. Every month BDO, Premium Partner of StartLife, will introduce one of the nine performance fields to you by asking critical questions, providing you with tips or sharing insights and perspectives with you through cases and interviews. Doing business successfully often means responding to customer needs and market developments as innovatively as possible. Business models are continuously subject to change and it is therefore important to regularly dwell on your business strategy. Below you will find some questions that will assist you with doing so. Do you have an overview of market opportunities and are you in constant contact with your (potential) customer about his (latent) needs? Do you have insight into the crucial qualities, risks, attention and improvement points within your company? Do you evaluate this regularly and does this lead to a specific adjustment? Are your business objectives clear, realistic and anchored within your organization? Is it also clear which product-market combinations offer the most perspective? Dutch dairy giant FrieslandCampina is a globally active company. Assessing external risks, identifying potential flashpoints and compiling an effective strategy to tackle them can’t simply be done from the head office in the Netherlands. ‘Think global, act local’ is the dairy multinational’s motto. What score would Hans Laarakker give FrieslandCampina for converting risks into strategy? Do you want to know more about the strategy and risks of FrieslandCampina, download the full article here: Scope – FrieslandCampina. BDO will be happy to help you take steps to improve your strategy or on one of the other 8 performance fields.